It is that time of the year again – SALA – when we celebrate the South Australian Living Artists and this year it is for the 15th time. How time flies! 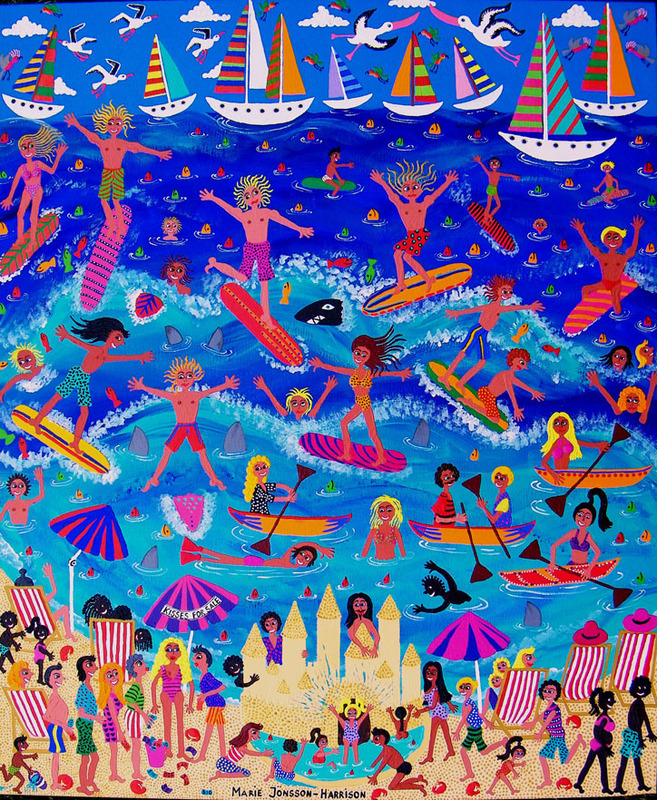 This Acrylic on Canvas Naive painting called ” SURFIN ‘N’ SA” is one of 3 artworks in the Sala Exhibition. Sala an idea which grew from a seed planted by Paul Greenaway who thought we celebrated the dead artists at the detriment of the living and I couldn’t agree more. Sala is a showcase for us artists that are not dead yet and that is a club I want to belong to! This year there are 3,453 participating visual artists exhibiting in 520 diverse ranges of venues. You will of course find art in Art Galleries, studios, public spaces, cellar doors, movie theater foyers, cafes and restaurants around the whole of our state. However did you also realize that down in Glenelg they are presenting an inspirational art trail that offers a visual feast to stimulate the senses. Jetty Road in Glenelg has totally embraced the Sala concept and nearly every business on this road has artists work on display. This means that when you come to the bay you will also see art in hairdressing salons, chemists, ice cream shops, clothes boutiques, real estate agents, shoe shops and jewellers, yes all kinds of business have gotten behind the art here at the bay. I feel very lucky to have lived where art is appreciated and embraced, for a long time it was in the mid-north town of Balaklava and now by the sea. The theme explored is Play at the Bay with over 20 artists taking part including Clint Habib, Cat Leonard, Dave Archer, John Hamilton, Margo Miles and Sue McKenzie. Sue McKenzie is an artist who is doing interesting work collecting discarded furniture from the roadside which she paints in bright bold colors. “One woman’s trash is another woman’s treasure” says Sue. Sue’s work is also on display at the Better Health Midnight Pharmacies. Another artist with two separate exhibitions for Sala is Sarah Philip her abstract work inspired by the ocean can be found on Jetty Road, Brighton in the Enuf Burger Bar as well as her stunning works of beautiful people which are my favorites showing at Westfield Marion – Events Cinema.